Mark Dally large mug II - 4¼" (107 mm) high. Mark Dally studied at Staffordshire University in Stoke-on-Trent, specializing in Ceramics and Surface Pattern. His studio is in Stone, Staffordshire. He uses traditional slip decoration techniques, trailing and brushing, in a distinctive and original style. 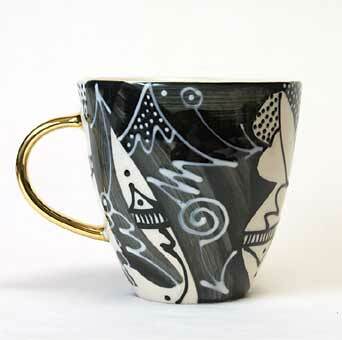 Mark's Black & White Ware is, as the name suggests, finished in black and white slip.He uses white earthenware body, high fired, and items with knobs or handles are finished with a third firing after the application of liquid bright platinum. Mark lists his influences as 'Homemaker' and pre-Hispanic Mexican and Australian Aboriginal motifs. You can visit Mark's web site at www.markdallyceramics.co.uk.